Examining language debates and literary texts from Noah Webster to H.L. 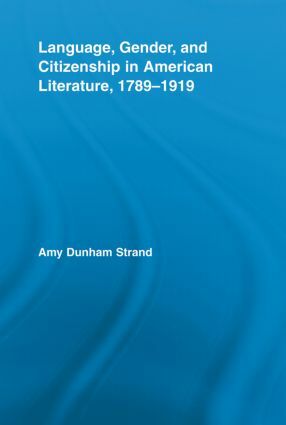 Mencken and from Washington Irving to Charlotte Perkins Gilman, this book demonstrates how gender arose in passionate discussions about language to address concerns about national identity and national citizenship elicited by 19th-century sociopolitical transformations. Together with popular commentary about language in Congressional records, periodicals, grammar books, etiquette manuals, and educational materials, literary products tell stories about how gendered discussions of language worked to deflect nationally divisive debates over Indian Removal and slavery, to stabilize mid-19th-century sociopolitical mobility, to illuminate the logic of Jim Crow, and to temper the rise of "New Women" and "New Immigrants" at the end and turn of the 19th century. Strand enhances our understandings of how ideologies of language, gender, and nation have been interarticulated in American history and culture and how American literature has been entwined in their construction, reflection, and dissemination.